INJURED CAPTAIN Danny Kirmond insists he can make a positive contribution to Wakefield Trinity Wildcats’ fight against relegation. And he has pledged to do everything possible to return to action before the end of the season, despite having been told it is unlikely he will play again this year. Kirmond is currently recovering from an operation to repair major damage to a shoulder. He said: “I tried re-habbing it, without having surgery. “I tried to get to the end of the year because sometimes you can do that with that sort of injury. “But it was torn 360-way round and the cartilage was gone and there was a bit of bone damage as well, so there was no other option really than to have surgery. “It is a 12-week recovery time. I did it in the home game against Salford [on June 14]. 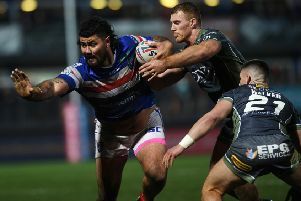 The injury was a blow for Kirmond and Wildcats, who are preparing to fight for their top-flight survival – against Super League’s other bottom-four clubs and the leading quartet from the Championship – in the forthcoming Qualifiers. The skipper has battled through the tough times this year and admitted it is disappointing to be watching from the sidelines as performances begin to improve under coach Brian Smith. Wildcats have won just once in five games since Smith took over, but have been competitive in each match. “That’s the frustrating thing really,” Kirmond said. “It has been a really tough season so far for us, but I think there has been a bit of a ray of light since Brian came in, both performance-wise and in training. “He is someone who really challenges you as a player and as a person as well. I kind of felt like it was something that really suited me and something I was really enjoying as well. “To get the injury at this important time, going into the back end of the season and the important games, has been pretty devastating. “But I can still have an impact off the field, being around the boys and things like that. You can sometimes inspire people with how you train when you’re injured as well. Kirmond admitted that will be “a push”. He added: “I have spoken to Brian about it and he says there’s no rush and he wouldn’t risk me if it was a risk. But I do normally heal quite well, so I am going to push as hard as I can. I want to play rugby, at the end of the day. It is one of those things, it is an injury you can’t push too soon or you’ll end up setting yourself back a couple of extra weeks.